In the spring of 2008, five gifted students from the University of Maryland were selected to be part of a committee that was taught the "intricacies of contemporary art and sent on trips to New York City and Washington D.C, where they visited multiple galleries and artists’ studios. The program concluded with the committee of students purchasing a number of pieces of contemporary art to be added to the collection of The Adele H. Stamp Student Union, Center for Campus Life." The committee’s selections were then on exhibition at the University's Stamp Gallery. I was very interested in seeing the results of what sounds like a very cool program and visited the exhibition a while back. This is the second iteration of this program, and a new one will soon be underway. The journey included a fall semester art theory course, countless hours in meetings to discuss independent research, leading up to exhilarating and exhausting trips to visit New York City and Washington D.C galleries. The committee worked directly with the galleries to both plan and schedule the trips and to acquire valuable information about the artists that piqued their interests. Final decisions were made after a formal presentation to an advisory board consisting of University community members and art professionals. It is safe to say that each artwork that the committee purchased was thoroughly researched and discussed. The student committee members were Sana Javed ’09, Ophra Paul ’08, Alison Reilly ’09, Alisyn Stuebner MA ’09, and Megan Wickless ’10. And I will report immediately that each one performed superbly and acquired work that definitely fits what the program aimed for. It is the program itself that needs both to be lauded (and I really, really like this program) and also fine tuned a little to make it more realistic and tuned to the University's own backyard's art community. I am told that the ultimate goal of the program is to "educate and inspire by exposing the campus community to challenging art created by noted contemporary artists. At the same time, committee members are given the opportunity to develop leadership skills as well as a deeper appreciation for art and the art world." More on the program itself here. The selected artists for the last iteration of the program and 2009 additions to the University's permanent collection are Barbara Probst, Dulce Pinzon, Jefferson Pinder, Edward Burtynsky, Annu Palakunnathu Mathew and Linn Meyers. All but Meyers and Pinder are photographs; Meyers and Pinder are also local artists to the DC regional scene. Mexican-born artist Dulce Pinzón challenges the stereotypes held against Mexican and Latino immigrants in the United States with her Superheroes project. In the wake of September 11, Pinzón found herself intrigued by the use and meaning of the word hero. The artist set out to capture images of those whom she considered the unsung heroes of her community—those immigrants who not only keep U.S. cities like New York running by working long hours for little pay, but who also support their families in Mexico by sending home substantial portions of their paychecks each week. 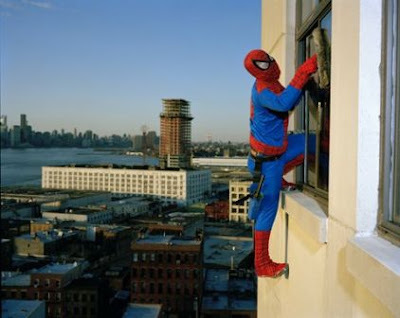 Pinzón captured immigrant workers performing their jobs in their work environments, dressed as popular American and Mexican superheroes. Each photograph is accompanied by a short paragraph providing the subject’s name, his or her hometown, and the amount of money he or she sends to family members in Mexico each week. 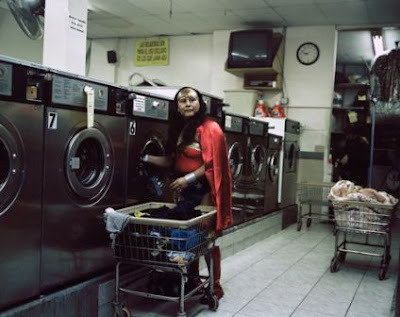 Maria Luisa Romero from the State of Puebla works in a Laundromat in Brooklyn, New York. She sends 150 dollars a week by Dulce Pinzón. The subject matter and aim of Pinzón’s project is both politically and socially engaging and would resonate with the University of Maryland community. The school sits on the border of the nation’s capital, a place where immigration is frequently the topic of debate. As in New York City, immigrants converge in Washington, D.C., to find work and to support their families, yet they are hardly given the respect and credit they deserve for the work they do. Adding works from Superheroes to the Stamp collection would provide members of this university’s diverse community an opportunity to challenge preconceived ideas of what it means to be American or a hero, as well as to question the role that perspective plays in defining identity. The visual juxtaposition of the costumed subject in his or her work environment will draw the viewer in, while the text will enlighten the viewer and present new ways of thinking about immigrant workers. Dulce Pinzón was born in Mexico City in 1974. She studied Mass Media Communications at the Universidad de Las Americas in Puebla, Mexico and photography at Indiana University in Pennsylvania. In 1995 she moved to New York where she studied at The International Center of Photography. As a young Mexican artist living in the US, Dulce soon found new inspiration for her photography in feelings of nostalgia, questions of identity, and political and cultural frustrations. In her black and white series “Viviendo en el Gabacho” (a Mexican colloquialism for living in the US) she illustrates the dualistic phenomenon of the integration of the Mexican immigrant into the New York landscape. She is currently a Ford Foundation fellow and lives in Brooklyn, New York Mexico City. I find it interesting that Pinzón's best work was triggered by the viewing of her Mexican kinfolk from an American perspective. It delivers powerful images with a resonant social message. I wonder if when Pinzón returns to her native Mexico she now "sees" her working class compatriots in a different light. I say this because Mexican society is very harsh on its own lower working class people, and the heroes of Pinzón's American photographs are often the same heroes in her own native land, as a visit to most any house or flat in Mexico City's Zona Rosa will reveal. The interesting fact that the Mexican government has one of the harshest and most oppressing immigration policies (Mexico has its own "illegal alien" problem in its southern borders) should yield some really interesting images if Pinzón were ever to do a new set of photographs depicting the painful issues faced by Salvadorean, Honduran and Nicaraguan illegal immigrants to her nation. Or the immense brutality of the Mexican government towards its own native indigenous population. It is an interesting political paradox for a government that pretends, Presidente after Presidente, to be progressive and liberal, while its own policies are short of fascist in some cases. A friend of mine, who is very high in the current Mexican administration recently told me a joke when we were discussing this political phenomenon. It seems that Mexican President Felipe De Jesus Calderon Hinojosa was driving former US President George W. Bush and current US President Barack Obama around Mexico City to show them some sights. They came to a T in the intersection and President Calderon asked, "Which way should we turn, left or right?" "To the right, of couse, heh, heh," snickered Bush in heavily accented Spanish. "To the left, my good friend," added Obama immediately. Calderon thought about it for a second, and began to move. "I will signal left and turn right," he said as he began to turn. This theme of ethnic and racial identification is one that runs through most of the pieces not only in the 2009 collection, but also in the earlier 2007 collection. Of the nine pieces acquired in 2009, six have some heavy handed form of ethnic or racial message. Some, like Pinzón, deliver right on target, while others miss a little or are somewhat dated. I was intrigued also by the overwhelming number of photographs acquired both in 2007 and 2009, and asked both the students and the course's mentors (Megan Rook-Koepsel, Stamp Gallery Graduate Assistant Coordinator and Jackie Milad, the program coordinator for the Stamp Gallery) if the photography-heavy acquisition result was due to (a) price and/or (b) the fact that photography is usually an "easier" starting point for beginning collectors. The budget for this program, made possible through a generous gift from Dr. and Mrs. Erik Young (UMD class of 1974), was $50,000 and I was told that "by the time the pieces are framed and transported the budget was spent." Quanah Parker, Washington D.C. 1880s/Annu Palakunnathu Matthew, Providence R.I., 2000s. Original photo courtesy: University of Pennsylvania Museum of Archaeology and Anthropology. My questions to all those involved in the program was: "Seven of the 9 works picked are photographs. In 2007, all but one of the pieces were also photographs. Is photography easier to pick for beginner collectors? If so, why?" 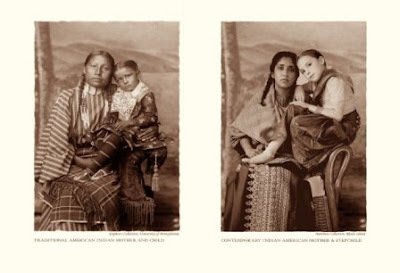 Traditional American Indian Mother and Child/Contemporary Indian American Mother and Stepchild. Original photo courtesy: University of Pennsylvania Museum of Archaeology and Anthropology. One answer to the above question stated: "No. This was something we discussed on many occasions. We wanted to broaden the variety of media in the collection but we found it very, very difficult to find non-photographic contemporary works which were within our budget, which were of a certain high quality and significance, and which also fit the themes of our collection. I felt like most of what we found in the galleries was photography." "We talked extensively about our tendency toward photographs. We often tried to limit ourselves in photography just for the sake of variety in the collection. But denying a work simply because of an established quota seemed too materialistic and unfairly nullified any argument of its worth. Also, many times we felt that the photographs we valued would have a greater impact on the university community than works of other media." As any art dealer will tell you, photographs are usually the entry point for many beginning collectors, as they are visually the easiest form of art to accept and recognize without too much "wall text" to explain their meaning. Furthermore, given this program's direction to steer the acquisition towards (as one student put it) "Our task wasn't simply to present to the university community a group of aesthetically pleasing works; it was to present to the community a collection of works which would make them think, which would challenge their own beliefs, and which would hopefully allow them to see (in a positive way) that they are attending one of the most diverse public universities in the country." It also seems from comments that some students interpreted the focus of the acquisition as a suggested task, but from the faculty perspective I was told: "The students really wanted to represent issues that are important to the University of Maryland community in their collection. Identity formation and cultural and social differences were some of the issues that they thought would be particularly salient. It was also important to them that they represent different kinds of artists, both women and men, and people of many different cultural and ethnic heritages." I was also assured that "we made it very clear to them that the final decisions were all theirs, so if they wanted to override our suggestions and encouragements they could." 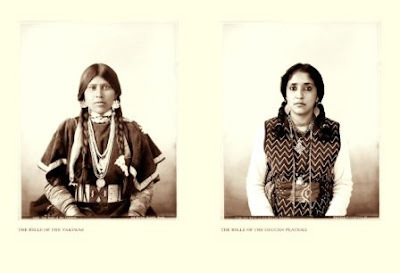 It is a photographic ethnic/racial representational thread that runs through both 2007 and 2009. In fact 12 of 15 works acquired so far have been photographs, nearly all dealing with ethnic and/or racial issues - in fact one can make the case that only two pieces (both abstract works) do not. I have some ideas on how to steer this overwhelming number to a more "diverse" set of art genres in the future. After all, diversity includes art forms, right? More on that later. Because the course says that the students are "sent on trips to New York City and Washington D.C, where they visited multiple galleries and artists’ studios," I was curious which Washington, DC galleries and studios they had visited. To say that I was disappointed on the answers is the understatement of the year. In fact, I will reveal my hand now and affirm that the one huge flaw in this otherwise terrific course is the astounding lack of local connectivity in this program. One student told me that they had only visited one DC gallery and that she was personally disappointed that they hadn't been to more. I asked her why not and was told that it was "too hard to get everyone together to see more DC galleries." A faculty member, responding to the same issue stated that "The galleries were visited based on the students' interests. I drew their attention to many different DC galleries throughout the year and ultimately they decided on a few to visit. (I might mention here also, that the students planned to visit the DC galleries after they had already been to NYC so their interests and goals were naturally narrowed based on their NYC experiences). Also, the students planned to visit a few other DC galleries but there were scheduling conflicts that ultimately led them to cancel their visit." So eventually, only one DC gallery was visited. But then I noticed that all of the works from "local" DC area artists both in 2007 and 2009 come from the same gallery. And thus I asked if there was a reason why only G Fine Art artists have been acquired so far in this program? Was this something that was "directed" by the way the fund for the program by Dr. & Mrs. Young was established? Or something that the advisory board directed? I was curious why for two versions of this great program only one local gallery has supplied the local talent? The answers from the faculty stated that it was "mostly about relationships, ease of working with the gallery and the art in which the students were interested." Another faculty member stated that "Like I said before, the galleries that the students visit have most to do with the artists and works they have interest in--they do a lot of research before they ever visit the galleries so that they can make appointments to see specific artists' works. Throughout the program I pointed to several DC galleries and made the students aware of a lot of openings, but ultimately they narrowed their interest to only a few DC galleries for visits. BUT there is definitely something to be said for a gallery's relationship to our students in the past. G Fine Art was extremely welcoming and excited to work with our students and spend time with them looking at works by the artists that interested them in 2007 & 2009; and because the 2007 program participants so enjoyed working with Annie Gawlak and G Fine Art, the 2009 students were definitely excited to go back again. The choice to go buy again from G Fine Art had nothing to do with Dr. & Mrs. Young's gift or with the advisory board's advice." (a) Invite gallerists to come and do presentations to the next class. Let them know ahead of time of the sort of diversity focus that the program is aiming for. If 20 DC area galleries are contacted, I guarantee that at least half a dozen will respond with quality presentations to the students. This will also improve the program by adding a diverse set of local gallerists to the mix, including African-American owned galleries such as Parish Gallery, etc. (b) As far as I can tell, not a single DC artist studio was visited. The DC area has clusters of artists studios all in one area, where it would be very easy to schedule a visit to half a dozen studios next to each other, such as a visit to Red Dirt Studios would yield. There are about half a dozen artist studios withing a few steps of each other in that area alone! (c) Since it appears that it is next to impossible to schedule visits to DC area galleries, how about visiting one or two of the area's top art prize shows? Here the homework has been done by local area museum curators in selecting the best of what the greater capital region area has to offer. This is an easy and brilliant way to expose the students (and the faculty it seems) to the best local artists according to blue chip jurors. So visit the Sondheim Prize exhibition in Baltimore, or the Trawick Prize exhibition in Bethesda, or the Bethesda Painting Awards. (d) Make it part of the course syllabus (all UMD courses are required to have one) for all students to have to attend at least six gallery openings of their choice and report back to the class. Put this in the course and the rubric used will be based on the report itself. I asked the students how many area gallery openings they had been to in the past year and the answers ranged from zero ("lack of time, cumbersome transportation, and higher priorities usually prevent me from attending" was given as an excuse) to "lots!". Attending gallery openings is by far the best way to immerse a new collector into a city's art scene; not all can be learned in a classroom. An art collector, any collector, needs to be able to soak in the art scene of the city that he or she is part of. The bottom line is that it is unfair and a bit lazy on the part of all concerned to just visit one gallery, the same gallery, for two years in a row. This underexposes the students to a significant number of DC area artists who are working on important work that fits the directed focus of this program. For Christsakes! In the same building where the students visited they could have arranged to see the work of William Christenberry and Nicholas and Sheila Pye! - Curator's Office: Nicholas and Sheila Pye or Jiha Moon. And the surprise will be that for the New York price of a photograph, the UMD collection will be able to acquire another genre of art. Notice that all non-photograph acquisitions so far have been (a) by DC area artists and (b) purchased from a DC gallery. That is not a coincidence. Linn Meyers. Untitled. 59x75 inches. Ink on Mylar. 2009. Linn Meyers is an artist of process—her works stand as evidence of her careful persistence. The difference between an artist’s intention and the realization of a work, and admitting that they can never be the same has long been a great concern for artists. Instead of accepting this human nature as a fault, Meyers has celebrated it. “Where else in life can one actually take pleasure in the fact that we are powerless?” she says. In order to emphasize the wonders of the realization, Meyers lets her intentions last only within each present moment, allowing the uncontrollable to flow into the work. Her earlier works experimented with a variety of forms—such as dots, lines, strokes, and tinted backgrounds—and explored the sublimity in the interaction of these planes. Many of her current pieces have lines drawn to initially follow around forms and then expand out to an edge of the surface. Subsequent lines are drawn beside the line before, imitating the same curves, even along areas of “slippage” where the pens may show signs of human error. As the surface is filled in, these features of error take the form of an elegant ripple. While geometry is utilized, Meyers admits that she cannot have equal control over forms. The simplicity of her process and the combination of basic artistic elements create works of wonder and beauty. Meyers’ piece is a large drawing of black lines on Mylar, which takes particular care in severely reducing elements in order to focus on the phenomenon of the process and the interaction of human performance with geometric shapes. She began a pattern, initially unknown, by following the curves of several tangential circles around the center of the sheet and then taking a natural curve out to an edge of the work. Areas of “slippage,” most evident in areas where the artist’s reach were naturally most strained and stretched, are echoed out to the furthest edges with each line added, creating a resonant beauty from the evidence of imperfection. While playing with the exactness of geometrically aligned circles, the piece becomes focused on the humanization of these forms, which contributes to the intangible life and ambiance observed. The size of the work allows the viewer to be more greatly emerged in the aesthetics while simultaneously welcoming careful scrutiny of each mark. Meyers’ work would contribute a number of outstanding qualities to the Stamp Student Union collection at the University of Maryland. Looking at its basic medium and style, the work would stand as the collection’s first drawing, expanding the collection’s breadth of media and artistic techniques. The work’s size invites views from up close and afar, which may especially benefit such a large public space. Additionally, as a more conceptual piece, it could reach a wider audience, spreading interest in the collection as a whole. And while it could be a “break” from the more highly postmodern works, it may also trigger interest in the messages of the other pieces. 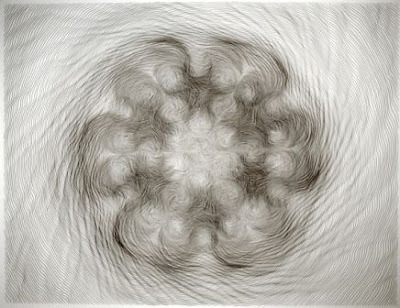 The universality of the drawing could even spark interest for students of a variety of academic disciplines, pulling interesting perspectives from mathematicians, physicists, cartographers, etc. Also, as a Washington D.C. artist with high involvement in the University of Maryland, Meyers’ inclusion in the collection would formally recognize her involvement in the community while at the same time honoring her rising success across the country. The untitled work is a meditation on the experience of human nature, and would provide a refreshing bit of confidence, especially in an environment filled with high academic expectations. The very talented Linn Meyers has been an Artist In Residence at the University of Maryland since 2008 and a past Trawick Award (3rd place in 2003) winner. Jefferson Pinder contributes the other non-photograph to the collection and its first video. Jefferson Pinder is an artist who believes that "few things are more persuasive than the moving image." The video series Juke has a unique feel and message to offer to the Stamp Student Union and the University of Maryland community. Pinder is interested in the meaningful interaction that can happen between an artwork and the viewer. As he says, "In an age where activism happens less on the street and more in the mind, I seek to create work that converses with the public." Juke is an engaging piece that questions the perceived racial categories in music and asks the audience to evaluate questions such as "Is there black music?" or "Is there white music?" 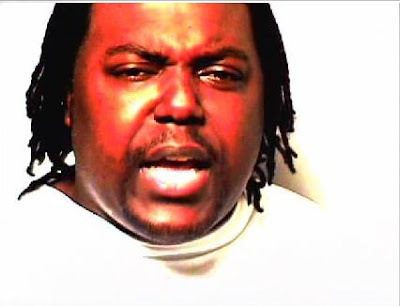 In each of the 10 videos that comprise the work Juke, the camera is focused on the face of an African American person against a bright white background. Each video features the subject lip-syncing and trying to relate to songs not typically associated with African American culture. By appropriating the songs through his lip-synching subjects, Pinder asks the viewer to re-interpret the music and to consider the stereotyping involved in categorizing music as belonging to one race or another. As Pinder explains in his personal statement, “I explore interests that not only relate to identity but also tie into a larger fiber of the human condition. My music videos exalt the soundtracks of life, as all of my work is a metaphor for my cultural journey. These thinly layered video pieces speak less of technology and more of the dynamic representation of a human experience. Inspired by past generations of artists, my work seeks to bridge a connection between what has come before and what lies ahead. I offer little direction. (That is in keeping with my generation.) Rather, I find interest in creating work that documents dynamic details of this ever-changing cultural landscape." We propose to acquire five of the videos that comprise the series Juke. These videos will add untold value to the collection as they challenge ideas and ask questions that are extremely relevant to the diverse University community. Adding these works will provide students with an opportunity to discuss and think about race, diversity, and identity. Additionally, having received his MFA from the University of Maryland in 2003, and now as a faculty member of the University of Maryland art department, Pinder is a valued member of our community and we think this connection would add great value to this acquisition. As a testament to the relevance and importance of his artwork, Jefferson Pinder has also been featured in museums and shows in the past all across the nation from the Oculus Gallery to The Three Rivers Arts Festival. Jefferson Pinder will soon be exhibited at the National Portrait Gallery, The High Museum, and the Neuberger Museum of Art. I really liked this video the first time I saw it a couple of years ago, and it is still a very refreshing and somewhat liberating work. Pinder's elegant way to approach the subject of stereotyping, in this case music, is right up my alley in my pedantic fight against labels and artistic segregation by race or ethnicity. This is a simple and yet powerful idea which Pinder delivers superbly. This work alone can satisfy the University's overwhelming need to select artwork that delivers a strong message on diversity. But I am back stuck on neutral when I realize that both Pinder and Meyers, both terrific artists on their own and easily terrific picks for the collection, are both associated with the University of Maryland (he is part of the school's faculty). Because both Meyers and Pinder are artists who were easily available to the students, it suddenly gives the appearance of taking the easy way out in the selection of work and reinforces my belief that this program is in dire need to expand the way it presents "Washington DC galleries and studios" to the course's students. The weak pick in the exhibition (every group show has a weak link right?) is Edward Burtynsky's Silver Lake Operations #1, Lake Lefroy, Western Australia. Maybe I've seen one too many quarry, refinery, recycling yard and abandoned mine. They all are beginning to look the same to me by now. I'm hoping that the Oil exhibition at the Corcoran will re-kindle my interest in these Teutonic sized photos of samo, samo. In summary, this is one very special UMD program, which like all new courses somewhat needs fine tuning here and there, but overall needs to be applauded for its two iterations and observed closely in the current one to see what new gems the new set of student eyes will select. I'm looking forward to the next set of acquisitions! My final question to all involved was: if you had one more artist to pick, who would it be? Dean Goelz, Kumi Yamashita, Georgia O'Keefe, Lee Pratt, Julee Holcombe, Avish Khebrezahdeh, Jon Pylypchuk were mentioned. Charcoal and Conte on Crayon. 2009.